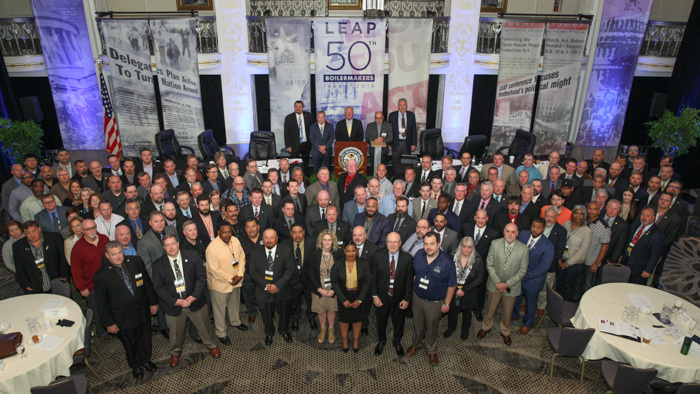 A FIERY SPEECH by AFL-CIO President Richard Trumka set the tone for the Boilermakers’ historic 50th anniversary Legislative Education Action Program (LEAP) Conference in Washington, D.C., April 22-25. The event brought 175 delegates from across the United States, representing nearly 50 local lodges. 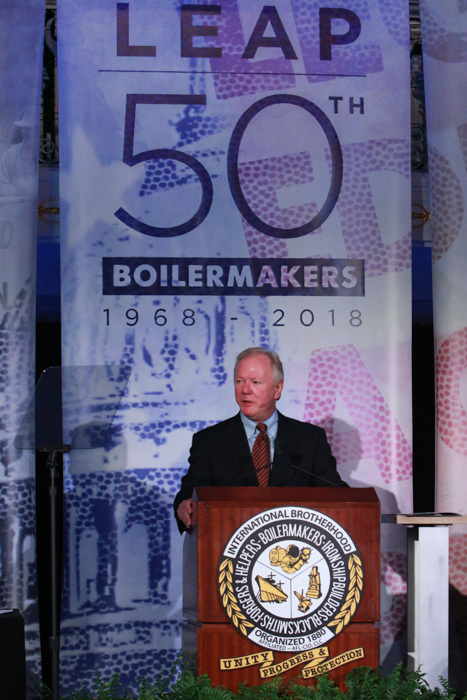 The conference also featured special awards to the Boilermakers’ Legislators of the Year, delegate lobbying on Capitol Hill and a reception for legislators at the Mayflower Hotel, site of the 2018 conference. International President Newton B. Jones opened the conference with a look back at the union’s involvement in political action throughout the Brotherhood’s long history. “I ask you to think about those who have gone before you, [taking part in] 50 prior LEAP conferences, those who also sat down with their legislators and stood their ground,” he said. “Because what we are doing here today is the culmination of more than a century of brothers and sisters watching out for one another and raising our voices together for what is right. “So, when you sit down with your senators and representatives, remember that you are not alone, and your voice is mighty. What you do here, as a representative of the International Brotherhood of Boilermakers matters — to your colleagues, to our union and to our future. 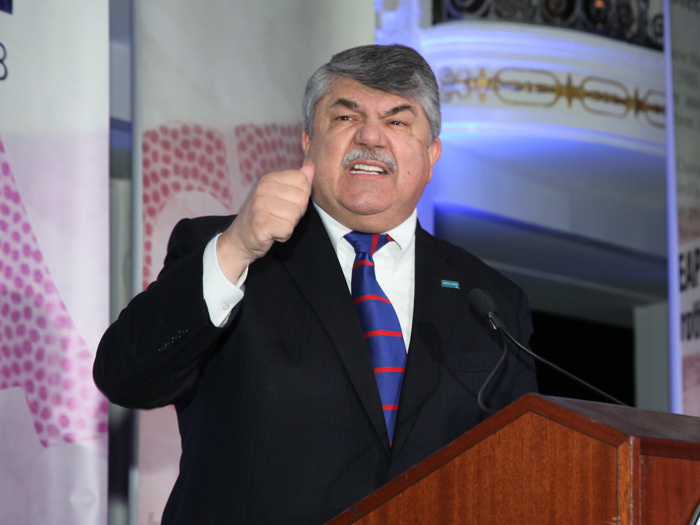 Trumka said union members need to shift their thinking away from being reactive and defensive on issues such as Right to Work and “hoping to keep what we have” to a mindset and position of unified power to drive decisions that benefit workers. “The attacks on us are greater than they’ve ever been,” Trumka said. “We’re the only organized voice for workers in this country. The truth of the matter is that we’ve been on the defensive for too long. It’s time to go on offense. Trumka congratulated Boilermakers for a history of dedication to political involvement. He told delegates that Boilermakers stand for excellence, high standards, safety, unity and unmatched commitment to training. 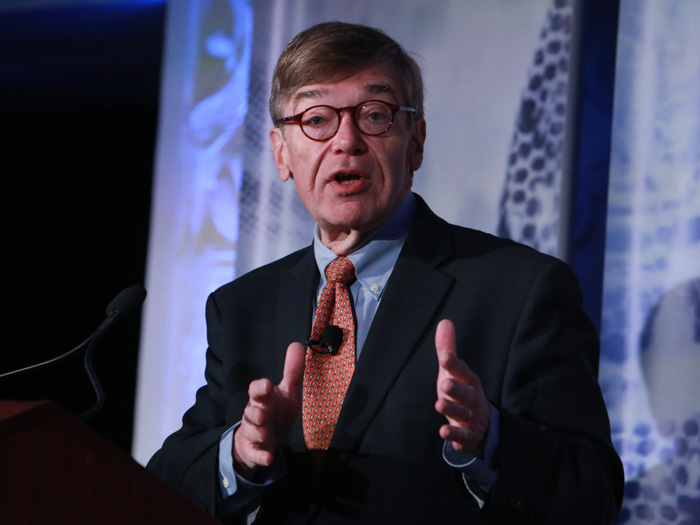 Members also heard from Charlie Cook, a noted political analyst and columnist, whose wry and insightful critique of American politics has made him a popular guest speaker at many venues. Cook outlined factors that could influence 2018 House and Senate races, as well as significant state elections throughout the U.S. He noted that the mid-term elections usually are a referendum on the sitting president. He predicted that Republicans could be “in for a shake-up” given polls that have shown the president’s approval ratings at the “lowest of any modern sitting president” and growing intensity among Democratic voters. “These polls are flashing danger, showing that the intensity of opposition to Trump is filtering down to Republicans,” he said. Cook added that the political climate could, of course, change before the mid-terms. He pointed out that during mid-term elections one-third fewer voters cast a ballot and that Republican intensity could ramp up, especially if a vacancy opens on the Supreme Court before November.